Have you ever seen the US Air Force Thunderbirds put on an airshow? They’re pretty good. If you can’t catch a Blue Angels airshow, they make a fine second string team. At some point during the team’s performance, the narrator will mention that the F-16s of the Thunderbirds are combat capable aircraft, needing only 72 hours to be ready to fight. That’s been a stock phrase they’ve used for decades. If the Air Force was really hurting for F-16 airframes, the Air Combat Command (back then, known at Tactical Air Command, or TAC) could probably generate plenty of airframes from other sources first, but theoretically, TAC could tap the T-birds to provide a combat ready jet. And so it was, back in 1988, having heard the T-birds mention the 72 hour thingy, ACC decided to put the claim to the test. (mandated) 72 hour period, a task never done before on the team. To make a long story short, the maintenance boys and girls, worked their backsides off and had the aircraft ready in less than 72 hours with the only exception being that the jet wasn’t painted (in the combat scheme). The aircraft tail number selected for this event was Thunderbird Number 10 which was 81-0679. There’s a lot more at the link, but suffice to say, that’s the only armed Thunderbird I’ve ever seen. Author XBradTC2Posted on June 28, 2014 Categories Air ForceTags air force, f-16, thunderbirds9 Comments on Thunderbomber! Not just for Warthogs either. Here’s a clip of an F-4 on what looks like the same pattern. The old F-104 could turn that trick too. Here’s a compilation of several jets taking off. Use of sections of the Autobahn as airstrips date back to World War II. During the Cold War NATO practiced this frequently. I know certain sections of highway in Korea were likewise set aside for contingencies. But I’ve seen very few references to American plans to use parts of our interstate system for emergency airfields. Then again, the United States has the highest number of airfields per capita in the world… and likewise the highest number of potholes per mile of any developed nation. Vmaximus was asking about the relative power of various weapons. 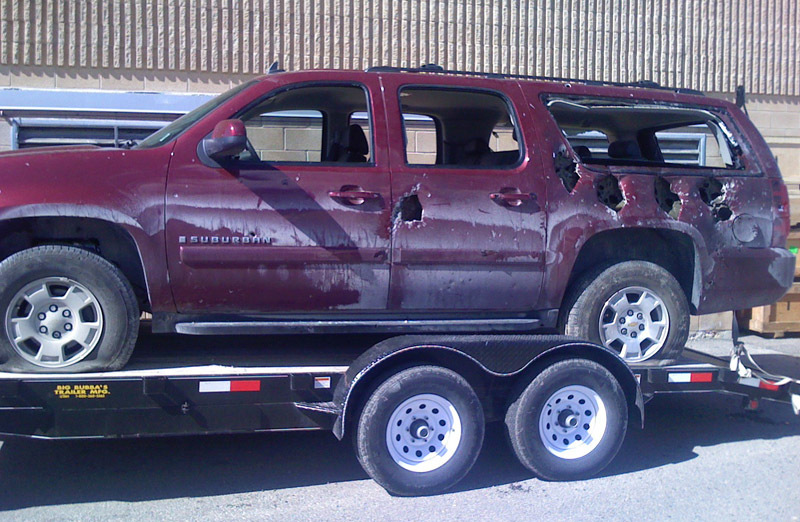 I don’t have any good shots to show on 25mm, but I can show you what 20mm does to an SUV. Turns out that an Air Force pilot lost the bubble for just a moment. Thankfully, the two folks inside escaped with only minor injuries. See the full story.